Scientists, researchers, members from the industry and administrators from the public sector came together at ICRISAT in an international conference to ask the big question: How to ensure modern innovation and digital agriculture increases farm productivity and profitability of resource poor farmers? The international conference kick-started with a unanimous agreement that breakthroughs in science and technology must be realized keeping farmers in mind and such breakthroughs along with their applicability must be communicated adequately to reach their full impact. The deliberations of the conference focused on how science can improve and develop agriculture, not only in terms of high yielding varieties and pest resistant crops but also in terms of providing accurate and crucial information that farmers require. Information on when to sow and how much fertilizer to use, factoring in impacts of region specific ecological developments and climate change is important. Accessibility of such vital information at the right time by farmers can define the threshold between yield and increased profits. The first step to ensure access of agriculture related scientific information requires accumulating necessary data and subsequent analysis. Therefore, the conference focused primarily on opportunities that exist for smart information systems and big data application in agriculture improvement. The next step would be management of big data to help solve developmental issues pertaining to agriculture and in achieving the sustainable development goals. The application of information technology to analyze biological data and to extract biological meaning from that data was one of the key themes of the conference. Dr Kelly Robbins, Director, Genomic and Open-source Breeding Informatics Initiative (GOBII), Cornell University, emphasized on high throughput genotyping to not only understand crop genetic diversity, but also the opportunity to sequence staple food crops. Dr David Bergvinson, Director General of ICRISAT touched upon the topic of large-scale phenotyping. “Our ability to track moisture accurately, to capture photosynthesis in a precise manner so we can unpack the optimization of water resources for biomass accumulation, green production and steadying the root system, making sure that we can optimally design a plant that enables us to manage our water responsibly and for the planet to withstand periods of drought, will be an increasingly important issue,” he said. Dr Robbins pointed to the opportunity and complexity in statistical approaches to relate phenotype to genotype with substantial accuracy. In this background, he introduced the Genomic Open-source Breeding Informatics Initiative (GOBII) which specifically focuses on enhancing the capacity of public-sector breeding programs (see box). In the realm of big data analytics, Mr Prashant Gupta, Principal Director, Microsoft Cloud and Enterprise Division, India, elaborated on the opportunity to instrumentalize intelligent cloud to transform agriculture steered to positively impact farmers with small land holdings. Mr Gupta explained that intelligent cloud offers an open and flexible platform with a global reach, to which scientists from any part of the world can contribute or access. He presented two examples of data driven agriculture: Farmbeats focuses on four aspects- farming-yield estimation, precision irrigation, pest-infection and fertilizer application. Data required to advice on those four aspects are acquired from the farm and collected on cloud using TV White Space technology. At the farm level a white space device such as a router is installed by the farmer that would facilitate data collection on soil moisture, nutrient content, etc. The second example Mr Gupta cited was the new sowing app developed by Microsoft in partnership with ICRISAT and the Government of Andhra Pradesh. This app is intended to advice farmers on soil health, fertilizer recommendation and seven-day weather forecast. The app runs on forecasting models equipped with historical region specific weather and ecological data. The sowing app is currently in a controlled experimental phase being implemented in selected villages of Andhra Pradesh. The international conference titled – Statistics & Big Data Bioinformatics in Agricultural Research was held at ICRISAT headquarters from 21-23 November. This conference was organized in association with the Indian Society of Agricultural Statistics (ISAS) on the occasion of its 70th year of operation. Dr UC Sud, Director Indian Council of Agricultural Research (ICAR)-Indian Agricultural Statistics Research Institute and honorary secretary of Indian Society of Agricultural Statistics (ISAS) announced that a special issue of the peer reviewed international journal of ISAS will be released for the conference proceedings. Other dignitaries who attended the event were: Dr Padam Singh, former member of National Statistical Commission and Executive President – ISAS; Dr S Ayyappan, former Secretary Department of Agricultural Research and Education – Ministry of Agriculture and Farmers Welfare and Director General ICAR and President ISAS; Dr K Alagusundaram, Deputy Director General, Agricultural Engineering, ICAR; Dr Jeffrey Ehlers, Senior Program Officer Bill and Melinda Gates Foundation; and Ms Joanna Kane-Potaka, Director – Strategic Marketing and Communication, ICRISAT. The Genomic and Open-source Breeding Informatics Initiative (GOBII) is the first large-scale public-sector effort to enable systematic application of high-density genotypic information to the breeding of staple crops in the developing world. By working closely with the CGIAR centers, the project will develop and implement genomic data management systems to enhance the capacity of public sector breeding programs to deliver increased rates of genetic gain in South Asia and sub-Saharan Africa for rice, wheat, maize, sorghum, and chickpea. The genomic data management systems will include databases, analysis pipelines, and decision support tools for plant breeders. The open source nature of this project also provides opportunities for other research groups to use this software stack in their own research. GOBII is funded by Bill and Melinda Gates Foundation and executed in collaboration with several stakeholders: International Maize and Wheat Improvement Centre, Cornell University, United States Department of Agriculture- Agriculture Research Service, Boyce Thompson Institute, International Rice Research Institute and ICRISAT. Sponsors: Integrated Breeding Platform, Biosci, VSNi, DuPont Pioneer, Sociovent, S Technologies and ICRISAT. 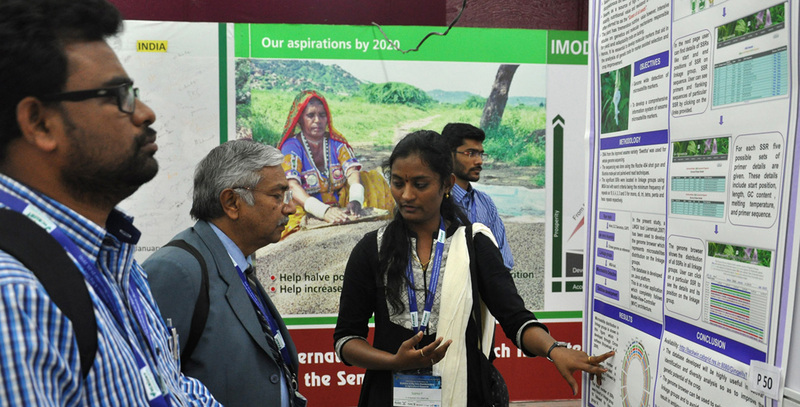 Partners: Indian Society of Agricultural Statistics and ICRISAT.